We live in a world of ever increasing data and data visualisation is becoming ever more important. Data visualisation is also becoming more mainstream. Wordle seems to be everywhere at the moment and Radiohead’s latest video has been made with data rather than cameras. Data visualisation of social network data is also becoming more prominent and there are some interesting initiatives around Digg (with Digg Labs), Flickr and particularly Twitter. 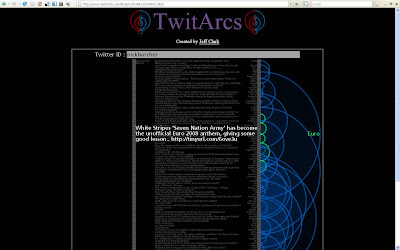 I have previously written about Twistori and Twittervision / Flickrvision, but today have found the most interesting Twitter visualisations yet! 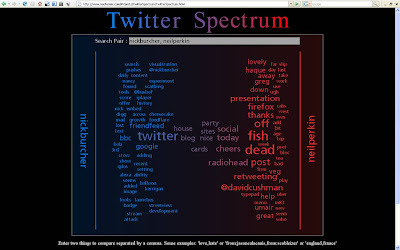 Jeff Clark at Neoformix is doing great work with Twitter visualisation and is producing tools that can both visualise and compare Twitter data. 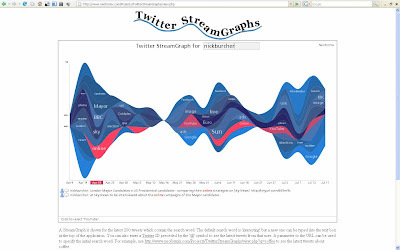 I have tested TwitArcs, Twitter Spectrum and Twitter StreamGraphs using my own Twitter ID. These are great tools for visualising Twitter data and I will paying close attention to Neoformix to see what Jeff Clark produces next!